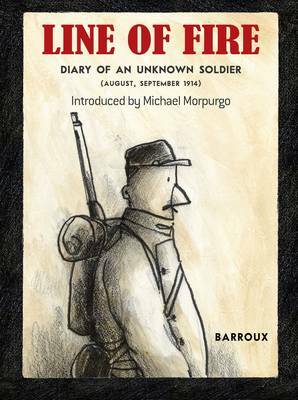 One winter morning, Barroux was walking down a street in Paris when he made an extraordinary find: the real diary of a soldier from the First World War. Barroux rescued the diary from a rubbish heap and illustrated the soldier s words. Our soldier recounts the first two months of the First World War, from the moment France officially declares war and mobilisation is announced, until early September 1914. His diary tells of the hope and the carnage; the long journeys and endless nights; the friendships, the horror and the hunger; the family he misses, the news he is anxious to receive; the sound of gunfire and the pain f swollen feet; the fear and the courage in the trenches; the sickness and the injuries; and a very narrow escape from death. In this striking black and white graphic novel adaptation of a 100-year-old diary, the events of the first two months of WWI are given fresh meaning through a man's story that is silhouetted against the historical events that formed and transformed the world we live in today. BARROUX is an internationally famous illustrator whose books include "Extraordinary Pets," "Mr. Leon's Paris," and "Where's Mary's Hat." He has worked as a press illustrator for "Forbes Magazine," the "New York Times," and the "Washington Post." SARAH ARDIZZONE has twice won the Marsh Award for children's literature in translation. MICHAEL MORPURGO is the former Children's Laureate and award- winning author of children's books including War Horse.